Most online retailers today typically rely on the same variation of an ad campaign as a part of their marketing strategy. What if there was a way to optimize ecommerce sales by implementing a different piece of content that could personalize the online shopping experience and increasing revenue? At physical retail locations, various brands are able to engage their customers in person, driving sales and establishing a unique shopping experience every time. What if we told you that it is entirely possible to recreate the same outcome with a quiz? That’s right, a quiz. If you haven’t come across them already on social media, quizzes have the innate ability to attract audiences and keep them engaged until the very end. Today, we’re going to use that same concept and apply it to your marketing strategy by showing you how to create your own quiz. Here at Interact, we’ve helped over 10,000 brands create over 25,000 quizzes, so we’ll show you some of the best practices we’ve picked up along the way that have made these quizzes so effective in different marketing strategies. Set a specific goal for your quiz. Choose a descriptive title for your quiz to inform the reader and raise curiosity. Select a type of quiz you want to create, such as a personality or knowledge type. Write clear and specific questions, no more than 8, in a tone and language that suits your audience persona. Set up lead capture and only ask for information you will use. Create shareable results that increase the quiz reach and satisfy the users. As an added bonus, we’ll be highlighting one of the more successful brands that have personalized the shopping experience with a quiz to drive revenue and continues to be a success story today. 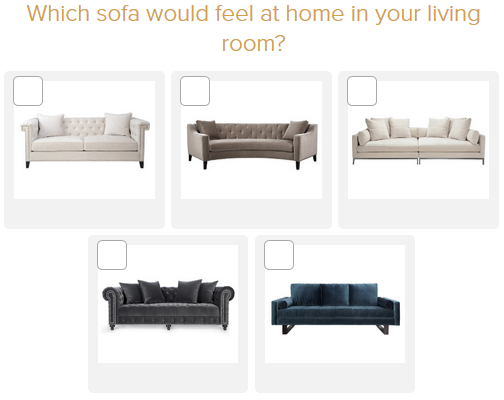 Z Gallerie created a quiz to provide a personalized experience for every prospective and concurrent customer. 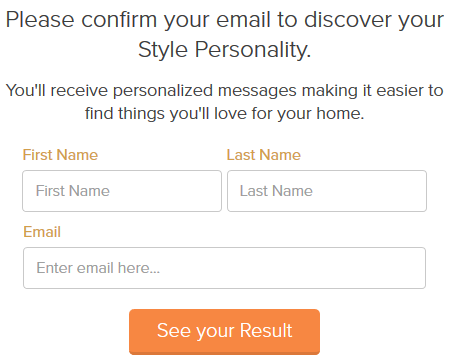 The style of the quiz asked a handful of questions which then collects your contact information and recommends a set of products tailored specifically to your preferences. They still use the same quiz to this very day in their marketing. The quiz brings in an enormous amount of leads per day, each of which are followed up with a personal way through marketing automation. The quiz drives a higher customer engagement both in stores and online, and the display ads stemming from the quiz generate 1.5x more engagement than their digital ad, resulting in a 1.4x lift in average order value. As we guide you through the process of creating your own quiz to drive ecommerce revenue, we’ll look back at exactly what Z Gallerie did so that you’ll be able to take away from their example and hopefully formulate your own or a similar idea to replicate their success. The “Actually” Title – This might sound a bit strange, but did you know that adding the word “actually” can change the entire structure of a question? Pretty neat right? For instance, compare “How much do you know about content marketing?” with “How much do you actually know about content marketing?” Quite the difference. The latter sounds more like a challenge, and that is exactly what you are going for when it comes to grabbing the attention of your audience. Challenge them to take your quiz. The “Which/What (Blank) Are You?” Title – Have you ever wondered which Disney villain you were most comparable to? This template can substitute the (Blank) with whatever your heart desires, and it’s the perfect way to get an audience involved. A lot of people are curious to see what or which (Blank) they are, and this title is sure to attract those particular individuals into taking your quiz just to find out, because let’s face it, sometimes we absolutely must know which character we are from Breaking Bad. 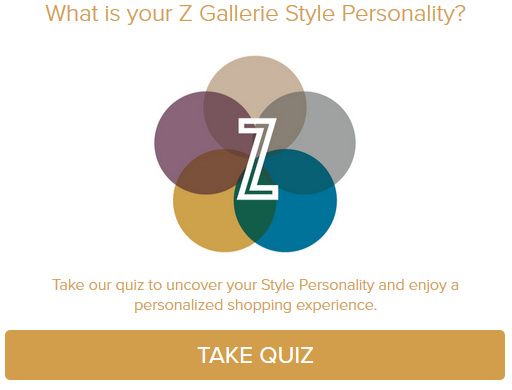 Z Gallerie created the quiz “What is your Z Gallerie Style Personality?” as a means of personalizing the shopping experience. Their title not only corresponds with their branding, but their target audience as well. It asks the basic “What (Blank) are you?” but incorporates their personality into it, making it completely their own. This is what you want to do. Come up with a title that’s you and your quiz will definitely stand out. The Personality Quiz – This quiz type will take an individual’s answers and determine which personality they fall under, complimenting them in the process. Because of the “self-serving bias,” people generally like to hear good things about themselves, which is what makes this quiz type so popular. The Knowledge Test – This quiz type essentially gauges how much someone knows about a particular subject. This one ties in with the “Actually” title since it already wants to know how much you actually know. The knowledge test delivers results based on accuracy. The quiz itself will let you know on the spot if you got an answer right or wrong and tally up your score in the end for you to review. 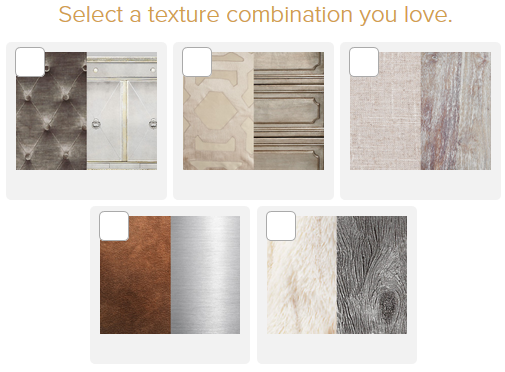 Z Gallerie went with the personality quiz (if it wasn’t obvious enough from their title). By going through a short series of questions, individuals were categorized into style personalities that fit their preferences. From there, Z Galleries assigned specific products to each style personality, offering an array of items suited personally to each individual. This was what made their quiz so successful. The personality quiz by Z Gallerie allowed them to personalize the shopping experience which in turn drove more sales online and offline. Take Things to a Personal Level – Do you remember what it feels like to have a casual conversation with someone you know? It’s devoid of any pressure, it’s relaxed, and it just feels natural. Model your questions after the same concept. Make things personal and inject who you are into your questions. This helps set a more comfortable tone of speaking, and your audience will appreciate you for it. Add Some Visual Elements – Simply put: include images in your questions. Adding a visual aspect to your quiz outside of the title and the results will turn it into a fun little trivia game for your audience to enjoy. Keep Time Constraints in Mind – Not everyone has five minutes to spare, so look to have about 6 to 8 questions in your quiz. This normally takes people at least 2-3 minutes to complete, and that’s just the perfect amount of time for a society that’s always on the go. Keep things short and simple and your audience will love you for it. Let’s go through each of the tips we listed in this section and see where Z Gallerie checked off on. Did they approach their audience in a personal way? Yes. Each question didn’t feel forced at all. They were naturally relaxed and did not require a large amount of thought to answer a question. Did they include images in their quiz? Definitely. They used images as answers for each of their questions. Did they stay within the recommended number of questions? Absolutely. They had a total of 6 questions, hitting the bare minimum and keeping their quiz short and simple. So what did Z Gallerie do to help drive their revenue in addition to personalizing the shopping experience? They collected their audience’s contact information with a lead capture and followed up in a personal way. Promise Value to Your Audience – Consider incentivizing your lead capture by offering things like a free entry into a giveaway, an ebook you have laying around, or even a personalized email with a bit of marketing advice. This just might help in convincing your audience to sign up to your email list. Only Ask for Information You’ll Use – The bare minimum is usually an email address, sometimes a first and last name. Try not to ask for more information than what you would actually use. There’s no sense in requesting a phone number if you aren’t going to call it. Z Gallerie is a prime example of how brands should be doing lead capture forms. They require only an email address and a first and last name. They were also sure to inform their audience that they’ll be receiving personalized messages with product recommendations, simultaneously being honest with their marketing strategy and throwing in a neat little incentive. Compliment Your Audience for Maximum Sharing – By complimenting your audience and making them feel good about themselves, these positive emotions increase the likelihood of social sharing. What does that mean? If your results evoke positive emotions, your audience will be happy to share them on social media. Use Captivating Images to Attract Others – When the results to your quiz are posted on social media, the very first thing people will see will be the image attached to it. That being the case, you’re going to want to use images that will catch people’s attention. Include a Call-To-Action in Your Results – Even if this is the end of the quiz, that doesn’t mean you have to end your interaction with your audience. Include a call-to-action, like a link to your landing page or maybe even other product recommendations. Don’t let your connection end when the quiz does. Be proactive with your audience and keep up with your marketing. Let’s take a look at Z Gallerie’s results. They made sure to include a very attractive image, showcasing whatever style personality someone received. Their description along with the image places an emphasis on selling the mystique of their designs, all from the results page. 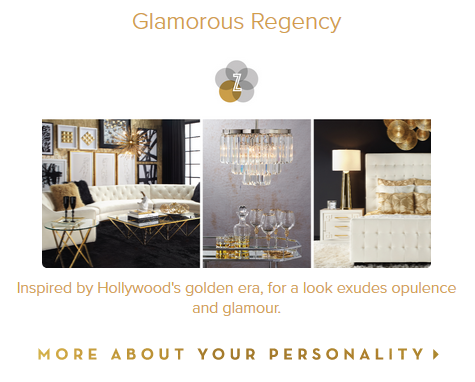 Z Gallerie includes a call-to-action in the form of telling their audience more about their personality with a link to more products and information. This helps drive their revenue even further as more and more of their products are talked up in the personalized email and the call-to-action included in the results. Think you’ve got a better feel for quizzes now? Today, you learned that it’s possible to drive revenue by creating your own quiz for your marketing. We went over title selection and quiz type choices. We highlighted some of the best practices for crafting engaging questions as well as some of the few ways you can optimize your lead capture. Lastly, we discussed what it takes to come up with share-worthy results. If you think you can come up with your own quiz to implement in your strategy to drive ecommerce revenue, then by all means. You just might end up becoming a success story featured in another one of these articles. I sell printers and printer cartridges, I’ve been trying to think how I could make a quiz involving and compelling using our products but drawn a blank. What would you suggest for a “boring” industry like mine?